PONG Expo LAN: let the games begin! PONG, the People’s Organization of Network Gaming, officially kicked off their first LAN party on Oct. 3. 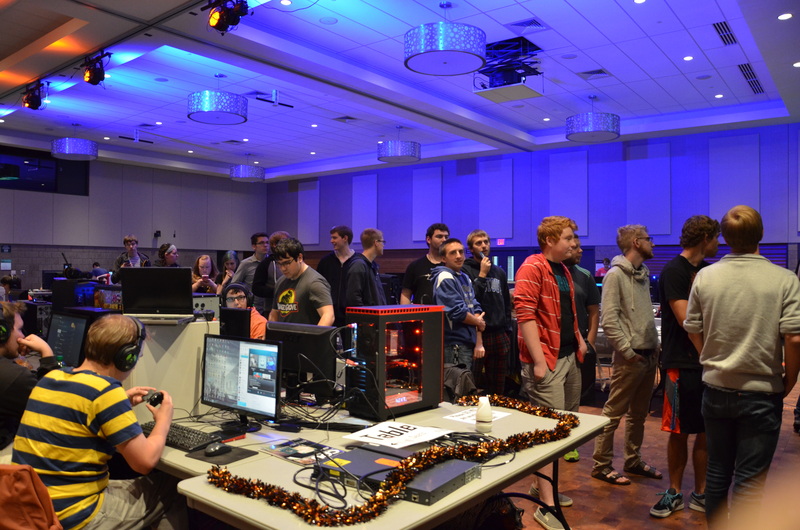 It was here where gamers from around campus united for a 48-hour gaming marathon. This massive event sprawled across the Memorial Student Center’s Great Hall and all three Ballrooms. Upon my arrival, it was clear that this was a big deal. Students hauled in their desktops, laptops and consoles by the hundreds to play a number of different games and participate in tournaments. League of Legends, often referred to as ‘League’ or ‘LoL,’ is always a major hit at these LAN parties. “It’s definitely the most popular game that gets played,” confirmed PONG Vice President, Daniel McCarten. No surprise, seeing as the game is played by 27 million players daily. Not all LAN attendees are looking to play “League” though. In fact, some have more casual outlooks altogether. “What we do is, everybody that registers for the event gets two prize tickets and for winning events you get more prize tickets and then we run a raffle,” said McCarten. “So we have a Minecraft keychain, Mario and Luigi hats, laser gun, clip-on microphone and Eevee Pokémon action figure,” he said, while scrolling down a list of prizes available to registered attendees. These are primarily won through the various game tournaments hosted throughout the 48-hour event. The agenda also includes, the dollar chug where attendees can chug dollar store soda for prize tickets and a download tournament where participants compete for the highest download speeds. One of the most significant achievements for PONG in relation to the LAN party, was their sponsorship with streaming giant, Twitch.tv. The sponsorship, which happened over summer, yielded an unusually large number of prizes for PONG to give away at the LAN party. According to Loeck, Amazon’s recent acquisition of Twitch made this so. Although the LAN event is about promoting a carefree environment while having fun with fellow gamers, lots of work goes into making the event run smoothly. “We do a lot of organizing,” said Loeck. An understatement, if anything. The club employs a variety of resources to keep the LAN party a haven for gamers. Event coordinators, network supervisors, tournament coordinators and the president himself all act as cogs in one finely tuned piece of machinery: working together to provide the best possible experience for attendees. PONG has gone so far as appointing a sponsorship liaison executive position. This position, filled by Lucas Benotsch, is solely in charge of racking up sponsors for big PONG events such as the LAN party. Going the extra mile to acquire sponsors cements their reputation as a club that works hard to serve its members. After all, these LAN parties are essentially PONG’s defining moments as an organization so it is imperative that they’re done right. I was certainly impressed by the overall scope and level of organization that the party boasted. The event itself may run on gaming and competitive spirit, but at its core, it provides a fun and friendly atmosphere for gamers of all kinds to unite under a common interest.